The most colorful crafts of the year are those for the Christmas holidays. Children enjoy making decorations, either to take home or for decorating a tree or room at the meeting place. Christmas time is the most festive time of the year and many times people start celebrating it weeks in advance. Usually, after Thanksgiving is over with, people start decorating already for Christmas time. This page is dedicated to the celebration of Christmas and all of the beautiful crafts you can make to celebrate it. 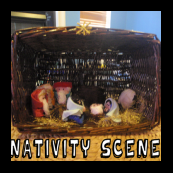 A Nativity Scene : From Start to Finish - Learn how to make the baby Jesus, the 3 Wise Men, Joseph, Mary, as well as a few animals. Use a basket for the Stable. Christmas Paper Toy Model - Play with these free paper printables...pretend it is Christmas Eve or Christmas Day...pretend to eat dinner and to sit in front of the fireplace. Santa is coming down the chimney. Fun. Making Popsicle Stick Santa Clause Christmas Tree Ornaments Craft for Kids - Make your own Santa Clause Ornaments decoration for your Christmas trees. This is just a sample Christmas Tree Ornament, you can use your creativity to make kings, angels and other Christmas characters using the same technique. Have fun. Christmas Gift or Party Bowls - You will simply take a plain glass or plastic bowl and use acrylic paint to paint a Christmas design on the front of the bowl. Christmas Paper Wreaths Craft for Kids - Here’s an easy Christmas wreath you can make with just some crepe paper, colored paper, a cereal box, and ribbons. This paper Christmas wreath is easy to make and great to hang on your doors at Christmas time. This easy step by step instructions are given on this page. Standing 3 Dimensional Christmas Tree Cutout - Learn how to cutout this 3D Christmas Tree. Decoupaged Christmas Napkin Jugs - Decoupage a Xmas napkin onto a white jug to make a Christmas Jug. Christmas Candle Arrangements - Learn how to create this Christmas Candle decoration. Homemade Christmas Napkins - Personalize all of the Christmas Napkins for a beautiful Christmas dinner with all your relatives and friends. Make Gift Wrapping Paper with Leaf Prints - Make gift wrap with leaf prints. Drinking Straw Chains for Christmas Trees - Wrap these around your Christmas tree to decorate it for that special time of year. Christmas Joy Decoration - Learn how to make this Joy Decoration made with paper and ribbons. 3D Paper Christmas Goose - Make a Christmas goose from simple white paper and a little folding prowess. Make Your Own Xmas Envelopes - Learn how to make your own Christmas Envelopes for your Noel Cards. Making Christmas Gift Tags - Find out how to make these Xmas Gift Tags with the following tutorial.